"This is SO delicious! I put this together after an x-ray because I wanted to eat something high in antioxidants and honey (for its antibacterial properties). What I ended up was a salad SO tasty, I just had to share it here. 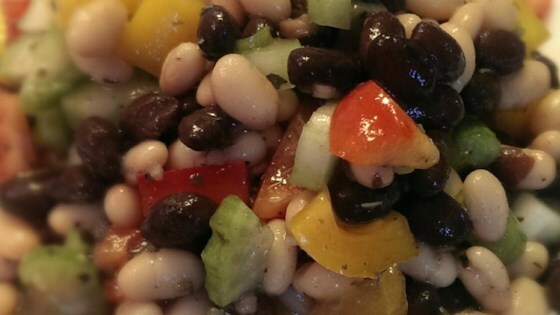 I'm sure that even the pickiest bean hating eater will love this dish! This is my new favorite and I can't wait to go and make some more!" Pour the beans into a mixing bowl, and stir with honey, vinegar, black pepper, basil, sage, garlic, hot pepper sauce, and olive oil. Stir until evenly coated, serve, and enjoy! This is a wonderful way to eat kidney beans! We skipped the sage and hot sauce cause the kids don't care for those. We all loved it! Thanks for the great recipe! Not my thing. My husband said it had a lot of flavor, but he won't be served this again. This was very interesting, and pretty good, too! I'm not sure that I would make it again, but it was a nice to have something different. Surprisingly good. I also added a bit of minced onion, and used two types of kidney beans for visual interest. might add green or wax beans next time around. Loved this! I doubled the recipe added chickpeas, blackbeans and lima beans also a small sweet onion. I omitted the hot sauce but this was awesome. this was delicious! i also added onions which made it even better! Great taste! And it's healthy, too!